Years ago, my friend Natalie taught a lesson during our women’s meeting at church about “Having Temperance in All Things”, which had a profound effect on me. I’d like to share my epiphany. Before her lesson, I’d say I easily understood the concept of “moderation” in terms of harmful substances (like sweets), or addictive behaviors (like binge-watching your favorite shows). But when I thought about what temperance in ALL things means, I had some trouble. For example, I was never very good at knowing how to be temperate in goal achievement. I’d aim high, and then I’d overbook myself and get overwhelmed by all that needed to be accomplished. Part of the problem was that I truly had the mindset that I could do anything – and that there was no such thing as doing “too much”. I didn’t always know how to temper my ambitions, because frankly, they helped me achieve some things that I was pretty happy about. However, sometimes my mortal body couldn’t keep up with the pace of my thoughts and expectations, and so predictably, I went through periods of unbridled ambition, followed by periods of crashing and burning, until I regained my strength to start it all over again. I’m telling you, that kind of pattern can eventually break a person, like bending a metal rod back and forth until it finally snaps. According to the Law of Cause and Effect, I knew that each time I took a step toward my goal, it took a step toward me. So I wondered, “How could it ever be okay to stop stepping?” Well, that morning before church it felt like I was on the verge of another crash-and-burn, so I prayed for insight. I wanted to know how I could keep making progress without burning myself out or incinerating my relationships. We got to church and during the third hour, I joined the ladies meeting. I like to make cookies. In fact, I have a wonderful recipe for Chocolate Chip Cookies that just works. Over the years I’ve used it, as long as I follow the right steps, we predictably end up with perfectly delicious cookies. If I set the timer for 13 minutes and take them out when it dings, they’re perfect. But if I get busy and ignore the timer, pretty soon I’ll start to smell them, and by then it’s too late. Even if I get a whiff and then run to take them out, it’s too late. They’ll be hard, dark, and good for nothing, except to be thrown away. 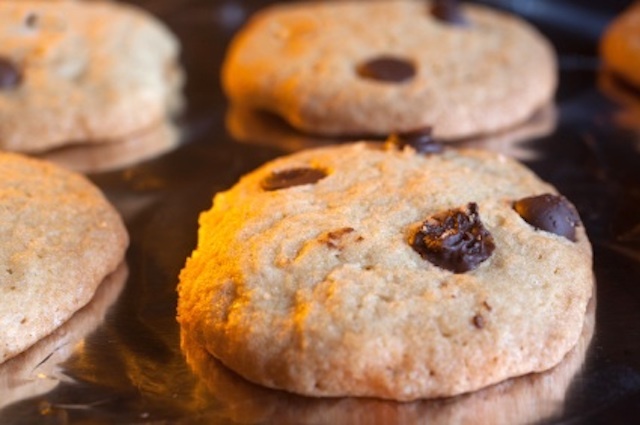 So, after mixing all the ingredients together, letting them bake is one of the most important parts – otherwise, you just don’t have a cookie. But baking them for the right amount of time determines whether or not they will turn out good. That’s why the timer is so important: to help you make sure the cookies don’t burn. Wow. I got it. I finally understood how too much of a good thing can be bad. That lesson had a profound and lasting effect on me. I was amazed and grateful that the Lord answered my question so directly, so clearly, and so quickly! For the first time in my life I could finally understand that yes, there IS such thing as too much, and if you push the limits, you run the risk of ruining everything. When the “dinger” rings, it’s not just okay to stop, it’s critical! Finding that middle place, finding your “13 minutes”, is so important. We have to trust that it is by “small and simple things” (instead of longer-than necessary intensity on things) that “great things are brought to pass”. Choosing this belief and abiding by it is an act of faith of the highest order. After my epiphany that day, I tried to listen more carefully to the Spirit of God that serves as my “timer”. It quietly alerts me when I’m pushing things too long or too far. And instead of rationalizing that “I can still do MORE!”, I try to remember burnt cookies, so that 1) my goal can get just the right amount of energy, and 2) so that I can also avoid burning myself out as well. As for the Law of Cause and Effect? Well, sometimes the right action is to take no action at all. Such good insight! We are also told not to run faster than we have strength. A good friend once told me we need only to contribute, not carry the full load. Our OWN strength, testimony, and continued commitment needs nurturing and service to ‘ourselves’ , for we too are important to the fabric of Christianity! (and society). We cannot lift someone or something to higher ground if we allow ourselves to be worn down. It is ok to say ” no” if needed. In fact it is imperative-perhaps a commandment! Your article is so important for ‘over-the-toppers’, and those dealing with burn-out! Hi Leslie. Why do you want me to attend your portal to genius-program? Thanks for your comments. You must have read my essay on Evolution Ezine? You are such a great thinker. My mind and my emotions are not on the same level. My time is full right now. There is a passage in Mark where the disciples go to Jesus to tell him of a man driving out demons in His name. Jesus’ response, “No one who does a miracle in My name can in the next moment say anything bad about Me, for whoever is not against us is for us.” God does continue to speak to his people. Additionally within the Christian churches there are differences in understandings and practices. One group believes they have the truth and the other group believe they have the truth. It seems we sometimes throw the baby out with the bathwater if the others don’t believe exactly as we do. Thank you for your work. Your work is tremendous! I have any easy time of understanding and applying it because I have already experienced it and just didn’t know why. It confirms principles I have witnessed and didn’t even know they were principles. I also love understanding the scientific reasoning behind them. Have you seen the book, “Quantum Faith,” by Annette Capps? She and her father have a short You-Tube discussion about it. I don’t fully understand all the quantum physics aspects, but she simplifies it enough that I see the parallel with faith. Again, thank so much for taking time to answer with my question. I will continue my pursuit and read from The Book of Mormon asking the Spirit of the Lord to aid my understanding. Thankyou for the great reminder. I will work on that–again. I want my life baked just right!! Everyone in it deserves it that way. The misery of the crash is never compensated by the grand effort. Thanks, Leslie. I need to be reminded, especially with trying to launch a web site, that it’s not about just ‘doing’ but really it’s about ‘being’. My inner wisdom still needs to be listened to more, but everyday is a new day and a better day somewhat. Thank you for that reminder Leslie. My pattern is so very similar to yours and I am just learning about what you have written in my own life. For me, it’s not about trying to find some sort of “balance” that some look for, nor is it to “be consistent” or “develop routines” (can you tell, all personal management techniques I’ve tried and failed at before). No, for me, it’s about being able to listen to my inner guidance that says “more, keep going”, or “that’s it for now” and having complete trust in it, no matter what the logic is. What you have taught me in the FTMF course about holding my goals in mind before making decisions and feeling for the right action has helped me tremendously and I’m very grateful for it. I can SO relate to this article – thank you! I’ve often even applied the vaccuum law to this same principle. If I am FULL of doing other things… then there is no room for other quality experiences and opportunities to enter my life. It’s the ‘good, better, best’ lesson… sometimes we get so focused on all the good and better that we overlook the best – and God is the best one to teach us what is ‘best’ in our lives. And that certainly isn’t always more of a great thing. Thanks for all of your inspiration! You’re the best! Thanks for this post today. Let me say up front that I too am a child of God, having put my faith in the atoning work of Jesus Christ, and therefore I have eternal life. I was thinking about this yesterday. I have read the Jack Rabbit ebook and I am reading through the Portal to Genius. Prior to coming upon your book, I already had James Allen’s book, “As A Man Thinketh” and had read it through. Additionally I listen to Andrew Wommack’s teachings and recently Annette Capps and her book, “Quantum Faith” and the thread is similar through and through. I also am reading “The Science of Getting Rich” and “The Secret.” On my blog the other day, I made a comment that if I were a run-of-the-mill Christian, I would steer clear of this type of thinking because that is what “they” say to do. However, I do believe in the grace that God has given us and there is much more to accomplish with my life on earth. Anyway, as I was searching for books similar to the above, I came upon one of your books, “Hidden Treasures.” In reading through an excerpt, you mention that you are Mormon. This is the reason for my post. If you don’t want to or feel this is not the appropriate place to ask about your faith, then you can delete this post. But since you mention your church and the Spirit of God in the above post, I wanted to ask a few questions please. In Hidden Treasures, you quote from The Book of Mormon. I have wanted to know how Mormon belief is different from Baptist, Presbyterian, Methodist, etc. Do we have the same statement of belief and just practice things differently? I don’t even know enough to ask the appropriate questions. Some “Christian” friends say that Mormon’s are not born again believers and therefore can’t have the Spirit of God within them. I can’t believe that, especially those that are outspoken about their faith. Things they say, they couldn’t know if they weren’t. I homeschool my children and I am implementing the Thomas Jefferson Education principles and have come across many other LDS sites and moms. I do agree with all that I have read about education, America, leadership, etc. and I know how my faith spills over into all areas of my life. Since my faith touches all aspects of my life and is such a big part of my life, I figured it does for others as well and in that case, LDS doesn’t seem any different than my Baptist faith. We believe that the Bible was a collection of prophets’ teachings – those prophets who lived in the Old World (around Jerusalem), but at the same time, there were other prophets in other parts of the world who were receiving revelations and ministering to those people, too. However, they had signs they could follow to strengthen their faith. For example, when the star marking his birth appeared, the people around the world who were listening to their local prophet knew what it meant, and they rejoiced. Then, when there was 3 days of darkness at his death, the whole world was darkened, but those who were listening to their local prophet on the other side of the world knew what it meant, too. Of course, there were many who did not believe the words of the prophets and persecuted those who believed. The records tell the stories of the believers and non believers, the wars and contentions, the teachings of the prophets, the record of the new star and the destruction at Christ’s death… and the best part is that it also tells the story of Christ’s appearance and ministry to those people after his resurrection. They did finally get to meet him, but only after his crucifixion and resurrection. It was also recorded around 34 A.D. (by people living on the American continent) that Christ said, “And verily, verily, I say unto you that I have other sheep, which are not of this land, neither of the land of Jerusalem, neither in any parts of that land round about whither I have been to minister.” (Which tells me that he is mindful of ALL his people, and that he visits them, and that the Bible is not the only witness ever written that Jesus is the Christ. After Christ came and ministered to the Jews, and after he organized his church and gave his apostles the authority to direct the affairs of his church… his official “organization” survived for only a little while. Christians were persecuted and hunted, and the few who had been given that authority from Christ were gone. Followers of the Christian movement desperately wanted the religion perpetuated, but after the organization had been broken up, there began to be conflicting views on how Christ’s church should be governed and how the work of saving souls should be carried out. Eventually, the arguments became so ugly, that the people and leaders of countries ended up in serious conflict about it. So the leaders called a council (headed up by the Roman Emperor Constantine in 325 AD), called the Council of Nicaea to come to some kind of agreement and end the conflict. That’s when the Nicene Creed was written – a vague and ambiguous statement of what “truth” should be, vague enough to appease all the conflicting religious and political parties involved. Not so much inspired by God, but a desperate movement by man to make peace. Around the sixteenth century, there were individuals who recognized that the pure truth had been contaminated and did their best to organize their various religions to match Christ’s church as closely as they knew how, but since there had crept in errors during the translations of the Bible, there were now differing opinions on how to interpret it. I believe this accounts for most, if not all, of the different religions that came out of the period of Reformation. Catholicism had become the national church for most countries in Europe, and yet it was so different from what many believed had been Christ’s original organizational structure, that people protested against the ritualistic creeds, and sought purer truth, and the result of those efforts were the various Protestant religions. By the 18th century, there was so much religious persecution going on in Europe, that America became the place where many people hoped to go live their religion in peace – whatever religion they practiced. That’s one of the reasons for the American Revolution – they wanted to be separate from England and to establish a place that guaranteed religious freedom for all. We believe America was divinely prepared for this purpose – to establish a government that would protect religious freedom, and a people who would be receptive to new revelation from God that would allow Christ’s church to be restored, complete with the proper authority and instructions to direct the affairs of his church and perform correctly the saving ordinances. Anyway, in the 1830s, a fourteen year old boy (Joseph Smith) was caught up in the second great awakening in upstate New York and was concerned about which church to join, and was confused because they all claimed to be right, but they contradicted each other. So as he was reading the Bible, he came to James 1:5 that said, “If any of ye lack wisdom, let him ask of God… and it shall be given him… but let him ask in faith, nothing wavering.” The spirit of God struck him so forcefully through that verse that he decided he needed to venture. So he went into the woods near his home and knelt down to pray to God, fully expecting an answer (think of how we’re taught that we don’t get so much what we want, but what we expect…) The time was right, the conditions were prepared, and God the Father and his resurrected Son, Jesus Christ appeared to Joseph Smith and told him that the various churches come close, but that the fullness of Christ’s church was going to be restored to the earth, and that Joseph was to be an instrument in helping it come about. He was told that there was an ancient record of God’s dealings with the inhabitants of the American continent buried in a hill nearby, and that he would translate the record by the power of God, and that it would be another testament of Jesus Christ to help his people understand the doctrines that had become cloudy over the years. The Bible is called the “stick of Judah” – because it was a record of God’s dealings with the tribe of Judah (Jews) – out of the 12 tribes of Israel mentioned in the old testament. The book Joseph Smith was given (The Book of Mormon) is called the “stick of Joseph” – because it was the record of God’s dealings with the tribe of Joseph who migrated to the American continent about 600 BC. With Christ’s teachings in the Bible and his teachings reiterated in the Book of Mormon, it’s a whole lot easier to figure out what his message really is. For example, he taught the sermon on the mount to the people in ancient America, too. So we have it in two places. He also clarified doctrines that he said were too difficult for the people in Jerusalem to understand because of their hard hearts. Besides receiving and translating the Book of Mormon (called the Book of Mormon because an ancient prophet named Mormon gathered, compiled and abridged a collection of writings from various prophets that had been passed down from 600 BC to 400 AD), besides translating the book, Joseph was also give the authority to baptize by John the Baptist himself who appeared to him as a resurrected being, and he was also given the holy priesthood by Peter, James and John. Joseph Smith was ultimately persecuted to death for saying he had seen God, but really, a person can decide for themselves whether he was really a prophet, or if he was a lunatic, by reading the Book of Mormon and asking God for themselves if it is a true record or not. It’s either true is or it isn’t. Joseph either saw God and Jesus Christ, or he didn’t. But if he did, then the church he established is true and is led by a prophet today who literally communicates with God just as the ancient prophets did. We are more similar to the people of the Bible than we probably know, because if this is true, it’s possible that there is a prophet alive today, and we have to decide for ourselves whether he’s for real and whether we should follow him or not. The people in the Bible had to face the same decision – there were prophets then, and many people believed and many others didn’t. It makes me think of Noah and the ark. As you can imagine, this claim is pretty bold, which easily ruffles a lot of people from other religions. I understand that, and I don’t let it bother me. The good news is that nobody has to take anyone else’s word for it – the heaven’s have reopened and God answers anyone who wants to know for themselves. Wow, did you ever expect to get such an earful (eyeful)? I hope this answers your question… keep in mind that there are a lot of ugly things out there against Mormons, mostly stemming from misunderstandings or misinformation. One of our official church policies is to allow all men to worship how, where or what they may (mostly because that’s the kind of freedom that God wants for his people, and what we want for ourselves). We strive to stay away from contention about religion, because where there is contention, the spirit of the Lord cannot be – and we all need the spirit with us as much as possible, don’t we? Anyway, I love the work that I do because it allows me to teach principles that are universal to all people, no matter what their religious beliefs are. I hope I haven’t overwhelmed you with too much information. If you have any questions about any of it, let me know and I’ll do my best to answer them.